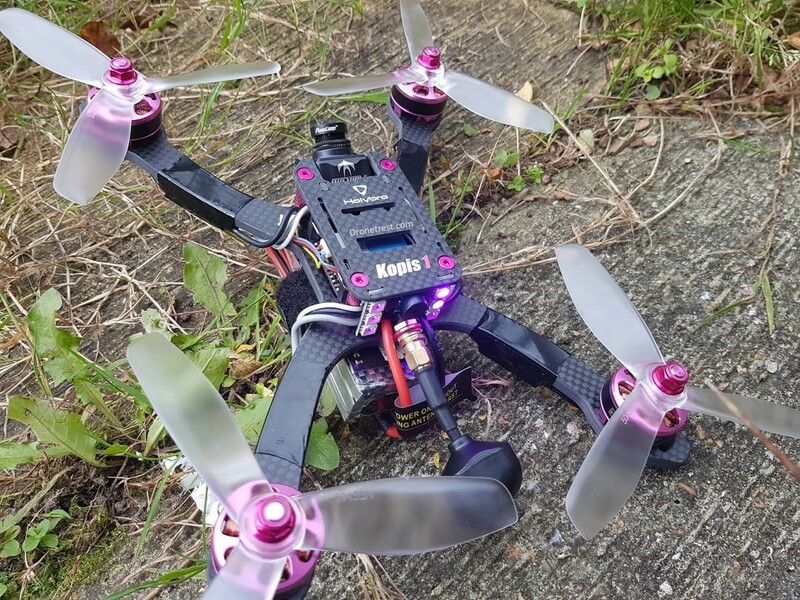 The Kopis 1 is the latest FPV racing quadcopter to come out of the Holybro headquarters, based on the impressive Kakute F4 FC, with a low deck stretched X frame design, on paper the Kopis 1 looks like it will be a killer quadcopter. But does it live up to the hype? Let’s take a look. Low Desk Design to keep COG inline with motors. Excellent flight performance out of the box with decent flight times. Uses excellent top brand components. Atlatl tramp telemetry compatible VTX. Antenna sticks out below the props to protect it during a crash. Stack with tramp telemetry compatible VTX. 5mm carbon fibre frame for maximum protection. Arrives well protected in a neat carry case. Mediocre cloverleaf antenna. Although the location keeps it protected, it also means it is often blocked by the battery an a action camera. 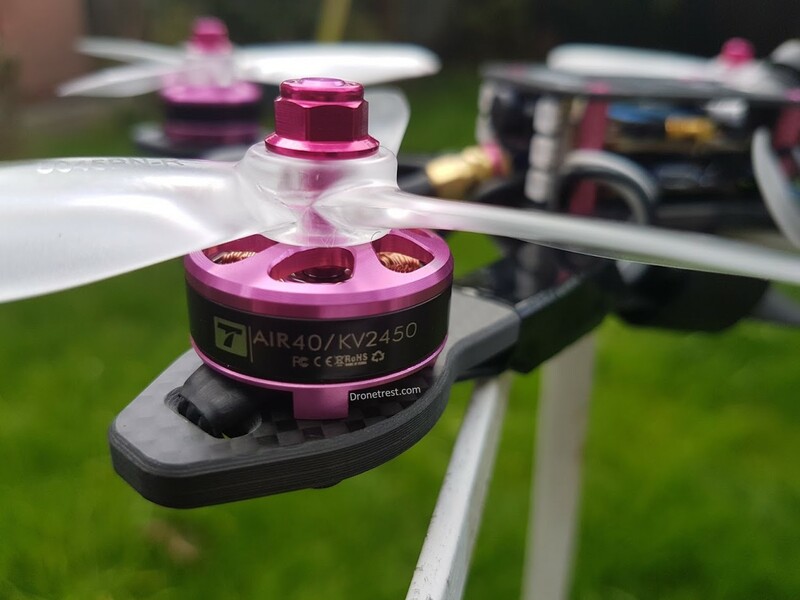 Air40 2450kv motors are not cutting edge anymore (but they are powerfull enough and offer excellent efficiency). ESC Motor wires are not the neatest. 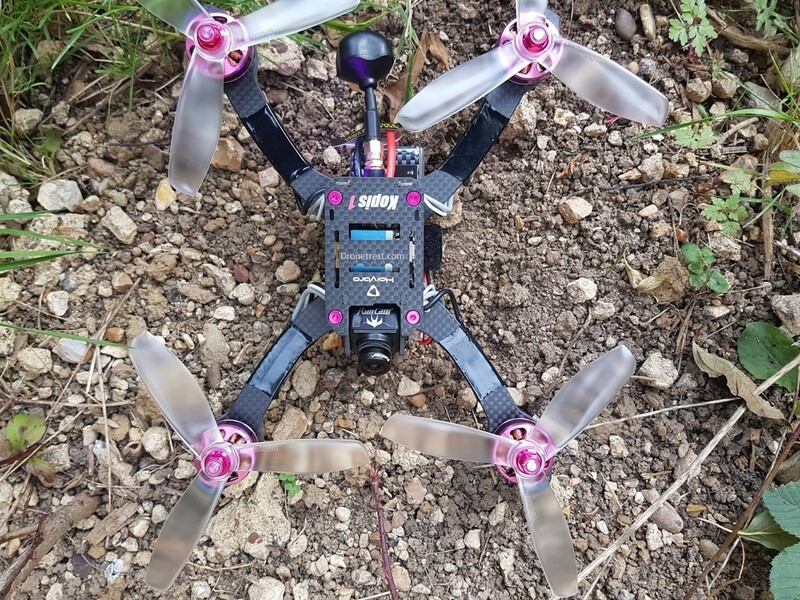 Not the cheapest quad (because it uses top spec components). 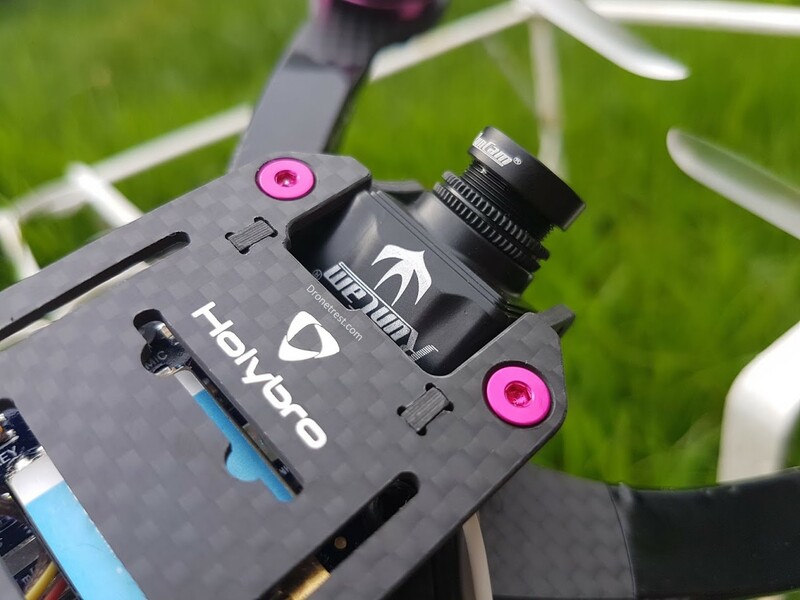 Holybro has done a great job with the Kopis 1, it ticks all the boxes when it comes to utilising the latest technology available for FPV quadcopters (Dshot1200, vibration damped 32Khz IMU, telemetry VTX). It then puts this all into a lightweight frame with decent motors. Sure there may be some FPV racers slightly faster than this, but they cost considerably more. And at this price point, you get an excellent drone that is hard to beat.. Right now I can say hands down, this is the best ready built FPV quad you can get for this price. The best battery to use with the Kopis 1 would be a 4s 1500Mah Lipo with at least 75C of discharge. So if you are buying from one of the links above and you don’t already have one. The Kopis 1 frame is a stretch X design which means that the motors are spaced out a bit more towards the front and back. 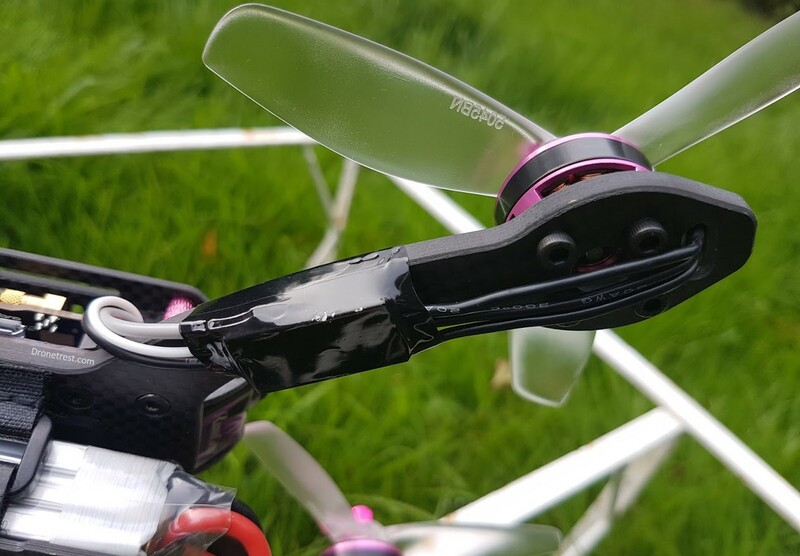 Since the gap between the front and read motors are more than a standard X frame, the air has more time to stabilise, results in the rear props having better performance. This is mainly felt when cornering at high speed, giving the quad a locked in feeling. Apart from that, the lightweight frame is machined to a very high quality, with nice chamfered edges which prevents any cables from rubbing. The arms are sufficiently thick to make them strong enough at 5mm. There are also some nice touches like countersunk screws and an integrated LED and buzzer at the rear end. Overall this Kopis 1 frame can trade blows with frames costing considerably more. I would argue that the flight stack on the kopis 1 is the best you can currently get. At the heart is the Kakute F4 AIO with the Atlatl video transmitter sat on top to form a low profile flight stack. The Kakute F4 uses an F4 MCU that and lets you query your gyro sensor at the maximum 32Khz sampling rate. You don’t need to worry about vibrations thanks to the vibration damped floating IMU. In addition to this, the kakute’s built-in PDB keeps weight down and provides a clean build aesthetic. The kakute also includes a betaflight OSD chip, letting you easily view and customise what overlay you want on your FPV feed. 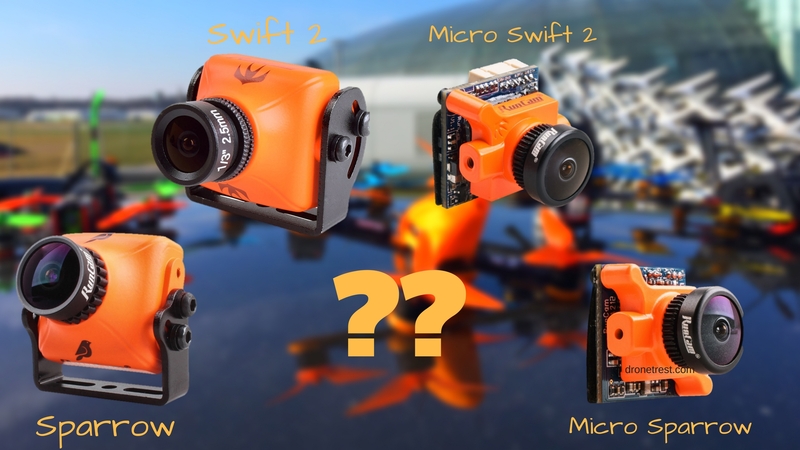 Its great to see that Holybro included an excellent FPV camera in the form of the runcam swift mini. 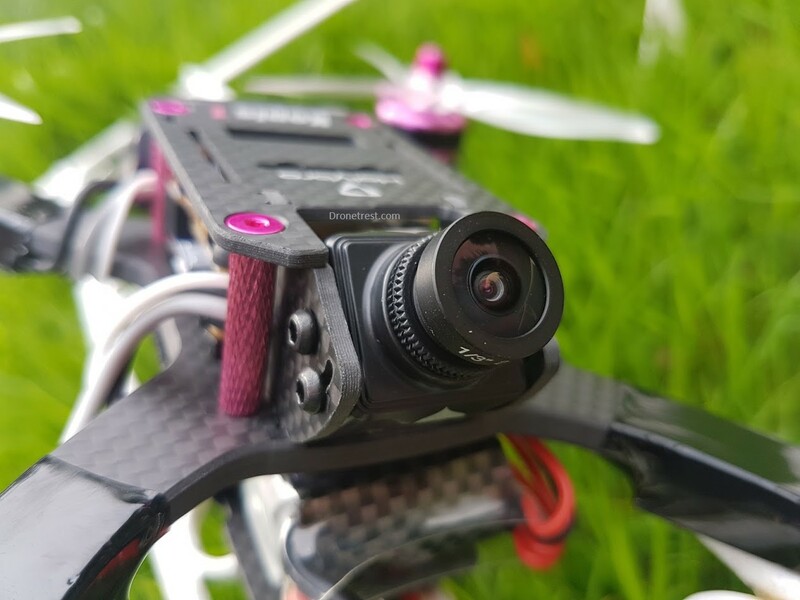 This itself is one of the most popular FPV cameras with a great picture and ultra-low latency. As for the Atlatl VTX, there are two standout features. The first is that it support tramp telemetry protocol. 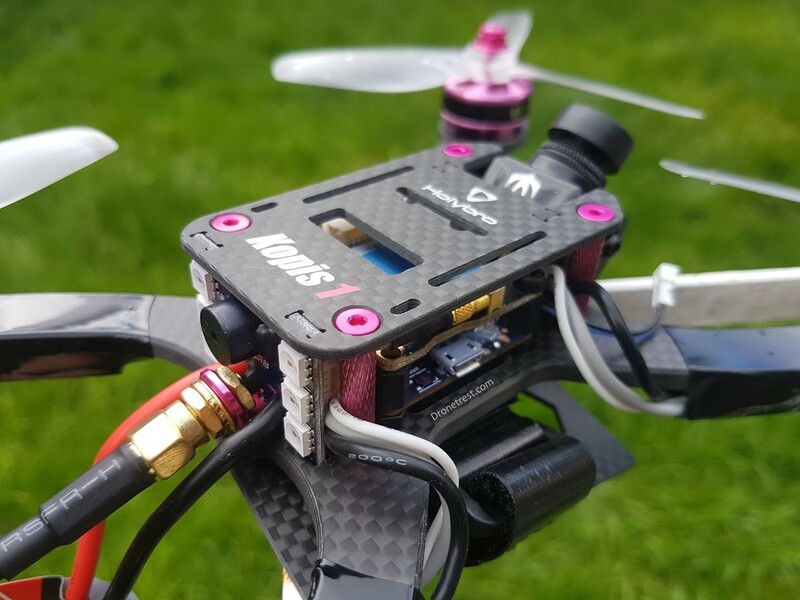 This allows you to change your VTX settings such as channel and power output directly with the OSD menus. This itself is much easier than fiddling with awkward DIP switches. The second is the MMCX Antenna connector which is extremely robust, and is very unlikely to break should something catch on your FPV antenna. However, that is unlikely due to the smart mounting location of the FPV antenna that sits below the motors, keeping it protected in a crash. The only bad thing about the FPV system on the Kopis 1, is the actual FPV antenna. This itself is not bad, but unlike the other gear used on this quadcopter, the antenna is a run of the mill unbranded cloverleaf. However, this is easy enough to upgrade with something like a pagoda 2, or TBS triumph antenna. One can argue that the motors are more important than the flight controller on an FPV racer, so it’s a good thing that the Kopis 1 has a decent power system to go with the other top spec parts. The T-motor Air40 motors are no longer cutting edge, but the excellent price, build quality and efficiency make up for this. 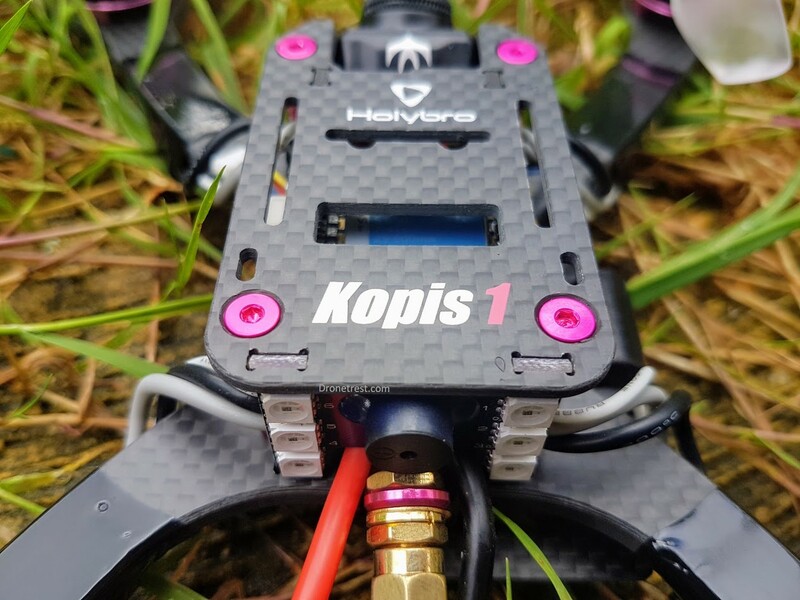 The motors themselves still provide plenty of punch, and with the kopis 1 weighing in at around 300g, the quad does not feel underpowered by any standard. 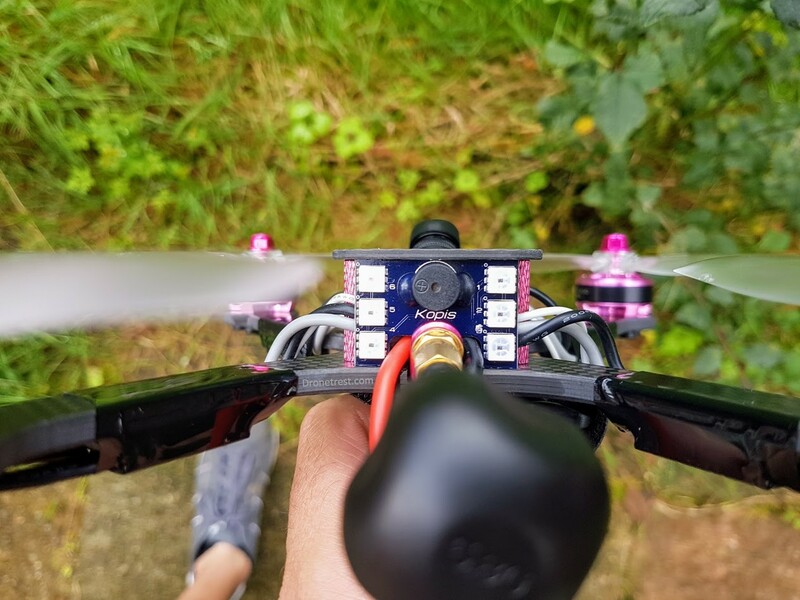 You may have a few less grams of thrust compared to newer motors, but the Air40’s make up for this inefficiency, giving you a few more minutes of FPV flying compared to other quads in this performance class. 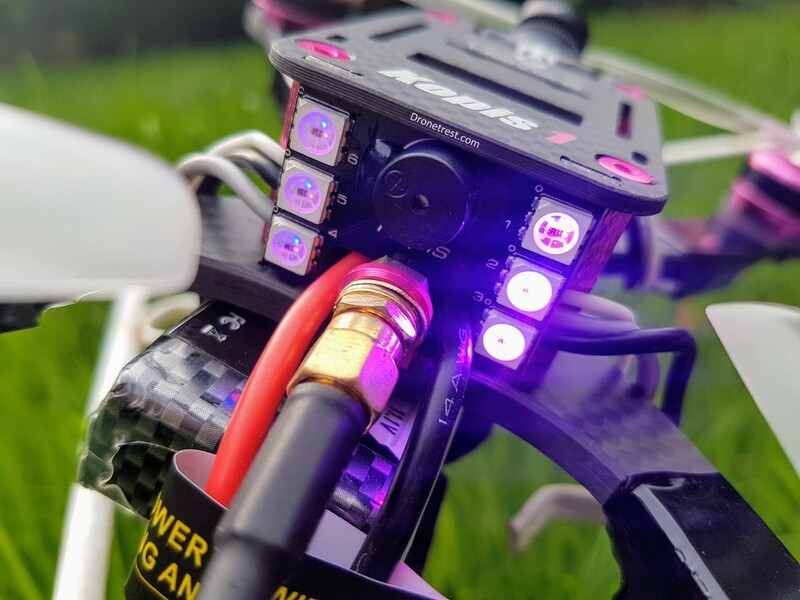 The excellent performance mainly comes down to the BLheli32 ESC’s running Dshot1200. These ESC essentially send motor speed commands at over 70KHz which is absolutely absurd. This coupled to gyro updates at 32Khz and properly tuned PID’s out of the box, you can see why the Kopis 1 flies so well! The only drawback here is that the ESC’s have some exposed wires that connect them to the flight controller. 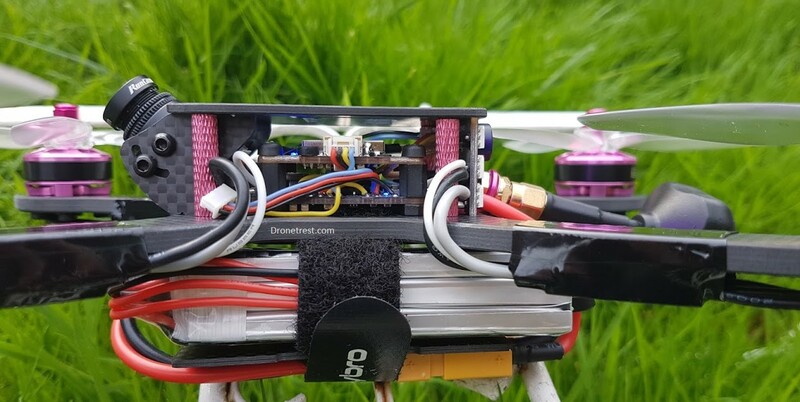 However, there is no way around this as Holybro decided to mount the ESC underneath the arms to keep them protected from the props in a crash. 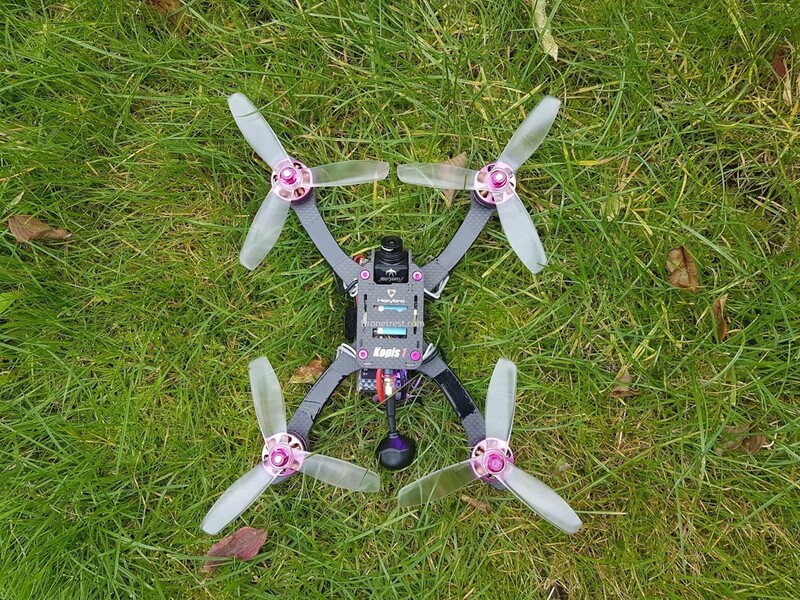 Since Holybro used excellent components, it is no surprise that the Kopis 1 is an excellent FPV quadcopter. The coupled this great component selection with a high-quality build, along with excellent out of the box PID’s. 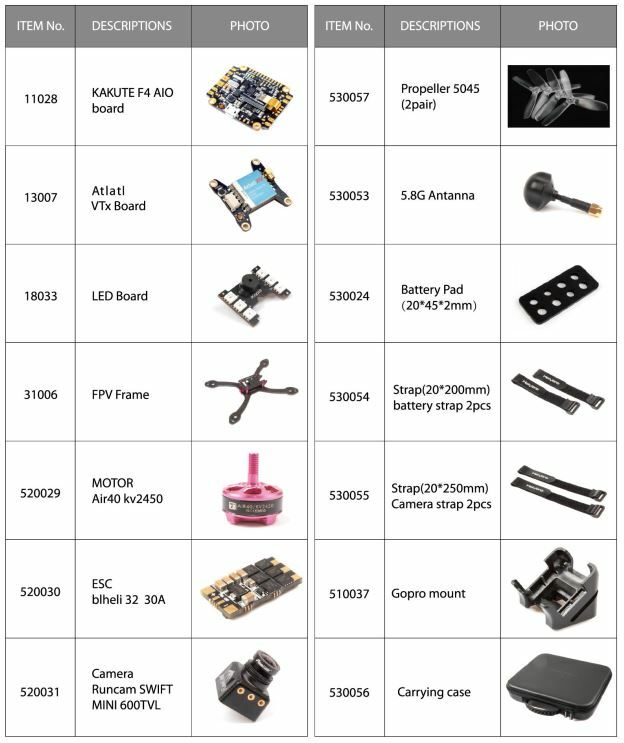 Although the Kopis 1 is not necessarily a cheap FPV quad, next to others of the same quality, the kopis 1 is a bargain. 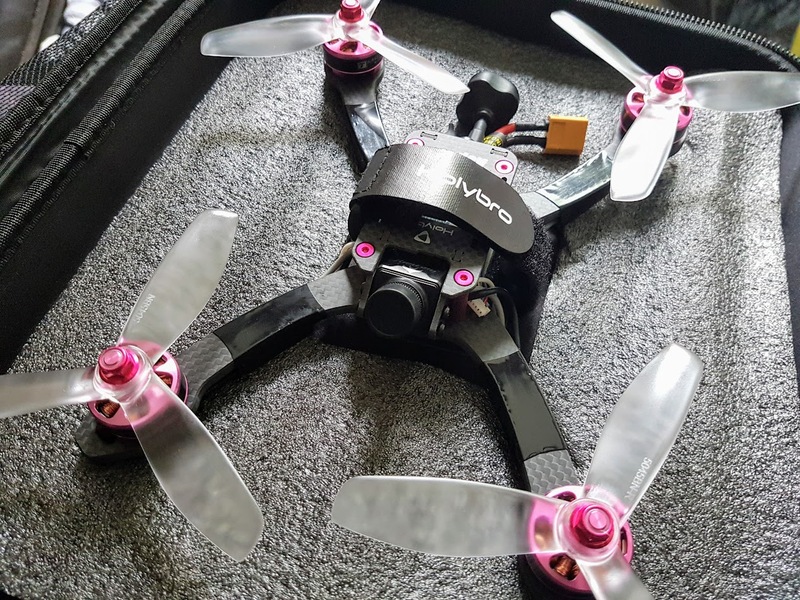 Because of this I highly recommend it to anyone looking for a high-performance FPV quadcopter. See here for where to buy one. 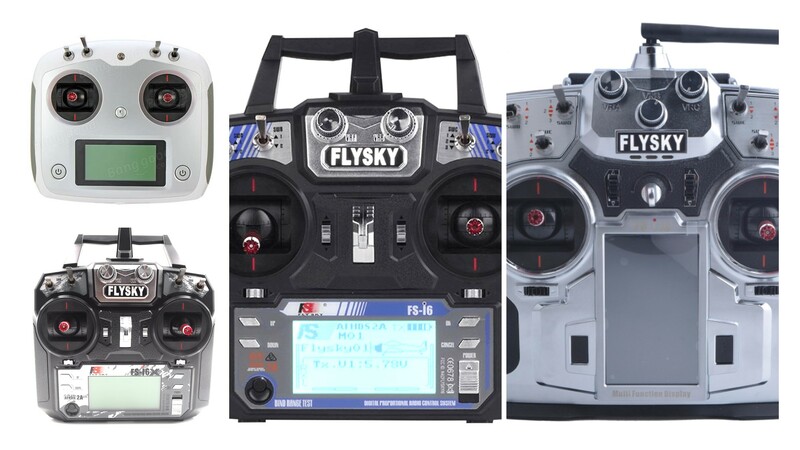 Flysky Radios 🎮 and Receivers 📻 for FPV Quadcopters - Which One Should You Buy?